Please Note:The round charm comes with a layer of plastic film to protect it,please tear it off before wearing. Weight 10.78g, diameter 2.54in, engraved disc measures 0.86in. We will try ou best to help you. 【Adjustable Charm bracelet】Enhance your feminine charm, No more large creases on your wrists from elastic bands. 【Made from 316L Stainless steel wire】Will not tarnish like silver and not fade like plated metals. 【 High quality round charm】Come with a highly polished with a mirror-like finish on the double sided, and there is a layer of plastic film to protect , avoid wear, keep luster. 【 FASHION AND NOVELTY】This bracelet has a slender design that's both fashionable and easy to wear. 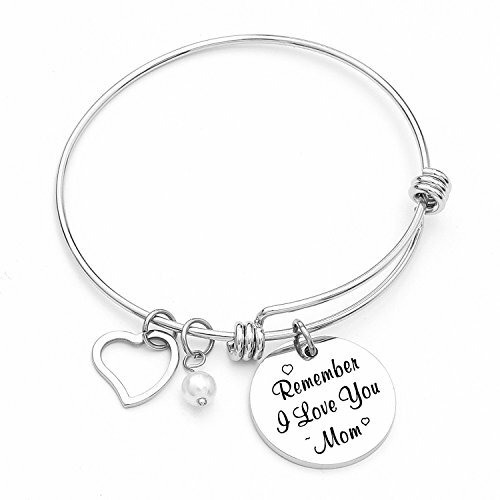 【 Perfect Mother's Day Gifts 】Gift for mom Christmas , Gift for Grandmother ,Gift for friend or that special someone in your life.It is an excellent way to remind Mother their children's love to her. If you have any questions about this product by Yoomarket, contact us by completing and submitting the form below. If you are looking for a specif part number, please include it with your message.